After spending some time on the last weekend in March hiking to D.E.W. Falls, and Johns Jump…. (waterfallshiker/johns jump/d.e.w.falls), I still had time for more exploring. Johns Jump and D.E.W. Falls didn’t take much time to get to and I still wanted to make an attempt to see Twin Falls on the Thompson River. From the parking area on NC 281 at Johns Jump, head south on NC 281 for a short ways. Just down the road, look for a right turn onto Whitewater Church Rd. Follow this dirt road up and past the church. There will be an intersection with Upper Whitewater Rd. Bear off to the left and take this road. Another intersection with Cash Road is next, but stay on Upper Whitewater. From here it is easy. The first bridge you come to will be at the top of Slippery Witch Falls. There is a nice parking area just before the bridge. Park here and head down a short but somewhat steep path to the base of the falls. This is Mill Creek again. This waterfall is also reachable by hiking/bushwacking upstream from D.E.W. Falls from what I have read. This waterfall is on private property from what I have read and been told. There are no signs for “no trespassing” and plenty of people seem to visit this one, so my guess is that it is OK. Slippery Witch…. 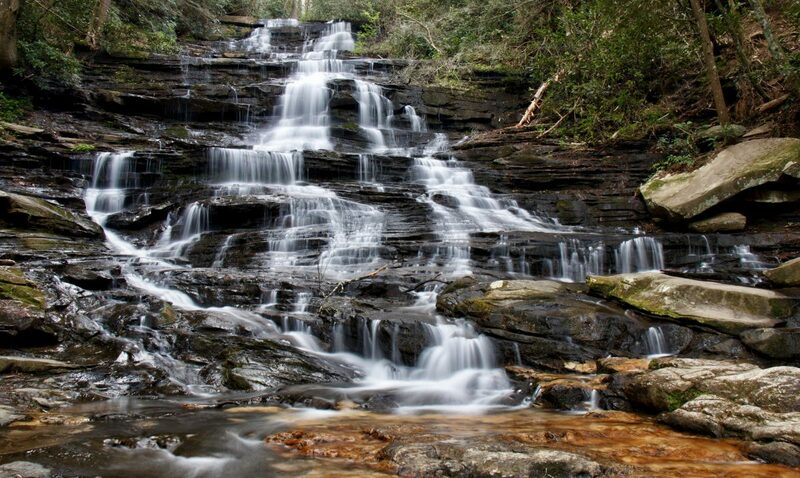 (love that name) is a 75 foot multi cascading waterfall. Lighting conditions were not to my liking here, but it is a very pretty waterfall with a nice pool at the bottom with a place to hang out. Above…a few shots from a previous visit here. The trail from the road above is somewhat steep, but nothing too bad, or long. Keep in mind that this is a 75 foot waterfall. The climb up will likely get some huffing and puffing. Once back at your vehicle, keep on this same dirt road for exactly 1.1 miles. The road which has been dirt since NC 281 had some rough patches in this section, a few holes that need to be watched for and maneuvered around. At the end of the 1.1 miles, another bridge. This time it’s the Thompson River. You will have just passed a very nice house, that can really be seen well from the waterfall. Some of my regular sites I used for reference list this one as unvisitable. I searched and found an article to find the waterfall at Examiner.com and decided it was worth a drive-by. Examiner.com/Twin Falls gave me the mileage and a good description to find it. Once at the bridge, I crossed over to where all of the land is still undeveloped. I parked and walked towards the woods right next to the river. Just like at Slippery Witch, I found no signs marking this “No Trespassing”‘ so I decided to proceed. I found a small path that led down and was marked with flagging tape. This looked like the right path and I took it. It was fairly steep, and loaded with dry leaves that caused me to slip several times down, ending up on my rump one time…lol. It is short though and comes to a wider path that heads right towards to falls. It was not a great day for photos, but this waterfall was impressive. I have seen it listed at 100 ft. The river splits above the falls forming 2 fairly equal volume drops. I was very happy to have my wide angle lense with me on this one as it is a large waterfall. Getting the photos I really wanted here, would have me on the people’s yard or downstream a bit. I didn’t want to be disrespectful, so I did not enter their yard. It was also about 50 degrees, so I didn’t get into the water to get downstream. I did get the best photos I could and also found a unique “deck” up on the side of the waterfall. It’s a beautiful house with a beautiful view. I hope to head back this spring on a better day for photos and get some shots down from the base a little. On the way back up, I stayed on the wide path, bypassing the trail I took to get down. It came to a forest road that was pretty eroded and steep , but came back up to the road I was parked on, just a short ways down. Waterfalls Hiker A WordPress.com Website.